There has been a lot of action on site over the past few weeks. Last weekend Pulp Friction was well and truly launched, and this weekend over 30 people learnt about bee keeping from Lee. The picture shows a number of "bee hotels" to attract solitary bees to the garden and a swarm of bees made from wool and plastic bags. 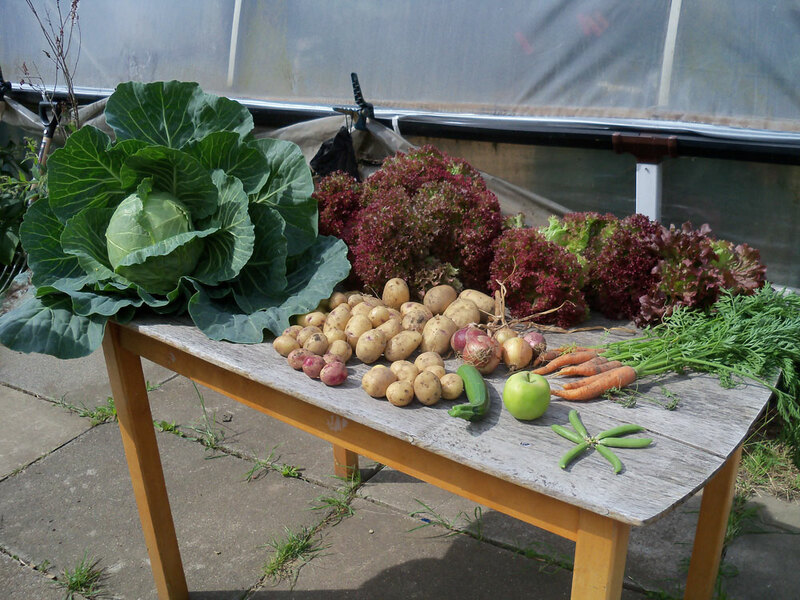 A selection of fruit and vegetables recently harvested at Dig In. After being a victim of convenience, eating tinned peas for many years, I had forgotten how good real peas, fresh from the pod tasted. Can you help to plan and deliver Our Apple and Pumpkin festivals? We need a small group of people who can give a bit of time to help organise or help at these events to make them as good as previous years.If you want to be involved let us know either through the blog or the Dig In enquiries email. 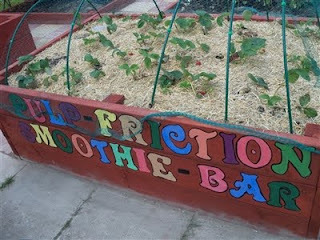 Pulp Friction have been working hard on site to create an amazing soft fruit growing area. A public event to launch and celebrate the project will be happening at Dig In on Saturday 23rd July from 10.00 -12.00. Some of the smoothie bikes will be in action, and there will be a chance to find out more about the project and the future plans. Everyone welcome. The first 3 months of the project have been a busy time. I have been supporting Foxwood school - who proudly harvested their crop of onions and chard today. Castle College has paid two visits to the site and will hopefully be returning in the Autumn. Bugs and beasties have been explored by Albany Juniors and the Cubs, a chance to promote the value of wildlife and diversity on an organic allotment. The Beavers are planning a few visits to do the same and help with our harvest in Autumn. I linked with the Framework Access to Nature project to support a group to come on site, a chance to promote the project to local people. Everyone went home with their own salad pots to grow on at home. I supported Pulp Friction when they built their beds. Chris from Pulp Friction with help from his family has done wonders to help the Dig In site become tidy of weeds and lay bark chippings on the paths. I have done a few outreach sessions at Surestart. Along with Local Food Worker Alan Withington we did a salad pot workshop with parents, and Mary and I helped with a cooking session with rhubarb crumble on the menu using Dig In rhubarb. 2 families came to a Cook and Eat session at the Dig In site in June. Over 30 people attended the willow weaving workshop and had a chance to express their creative talents making stars, fish and dragonflies. At the Hemlock Happening there was lots of interest in the project and in growing vegetables generally. We had loads of help to complete a well dressing in seasonal June flowers. Here's looking forward to the next three months!